Miss Piggy and Kermit in The Muppets. Kermit the Frog, Miss Piggy, Fozzie Bear, Gonzo the Great, the whole gang is back for a new show on ABC. The Muppets premieres this Tuesday at 8:00 p.m. And the thing that has me really excited about the show is it’s taking the behind-the-scenes antics that were part of the original Muppet Show and bringing them up to date. So, instead of seeing what goes on backstage while the Muppets desperately attempt to put on a theatrical review, we get to see what goes on behind the scenes as the Muppets attempt to produce a night-time TV talk show, Up Late With Miss Piggy. The Muppets is a reality show—well, as much of a reality show as a show about the Muppets can be. It comes complete with handheld camerawork, celebrity guest stars, and intimate one-on-one conversations with the cast. In fact, we’re going to get a little taste of that in today's show. Joining me today are some of the cast of The Muppets, starting with the green guy himself, Kermit the Frog. On Monday, September 21st, one of my favorite modern-era Disney animated films is going to be celebrating its 15th anniversary with a special screening at the El Capitan Theatre in Hollywood. The Emperor’s New Groove will be shown at 7:00 p.m. and will be introduced by an esteemed panel of artists: the film’s executive producer Don Hahn, director Mark Dindal, producer Randy Fullmer and screenwriter David Reynolds. In May of last year, Don Hahn was my guest in The Mouse Castle Lounge and among the many things we talked about was The Emperor’s New Groove. Return with me, if you will, to that show and hear what Don had to say about this extremely funny, irreverent and unlikely fan favorite. 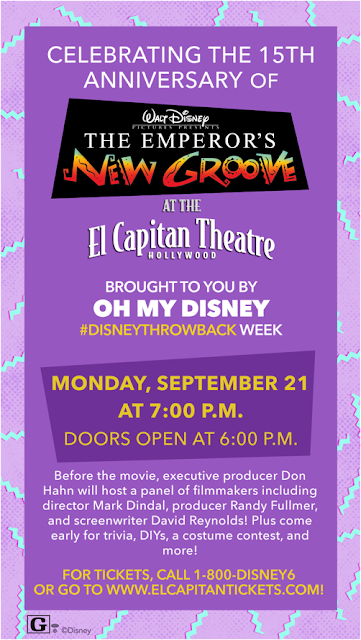 For our friends in the Los Angeles area, tickets are still available to see The Emperor’s New Groove on the big screen (and Don Hahn and Mark Dindal and Randy Fullmer and Mark Reynolds). Just call 1-800-Disney6 or visit www.ElCapitanTickets.com. The doors open at 6:00 Monday night and the screening starts at 7:00. I highly recommend you get there early for trivia, a costume contest and a whole lot more.